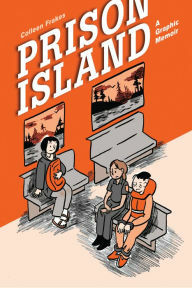 “Prison Island” by Colleen Frakes is a memoir in graphic novel form that takes place on McNeil Island in Washington state, the last prison island in the United States. Colleen and her family lived on the island when her parents worked at the prison. The story, told in black-and-white illustrations, describes her atypical childhood as a resident of the island where only families of employees lived. Although Colleen sometimes balked at the security drills and lack of pizza delivery, she conveys a sentimental reflection of being different from other kids her age as an island resident. I enjoyed learning about the history of the island and imagining Colleen’s life as both isolated from others and connected to a unique population including prisoners and prison employees. This entry was posted on April 14, 2016 at 6:48 pm and is filed under Adult Readers Advisory. You can follow any responses to this entry through the RSS 2.0 feed. You can leave a response, or trackback from your own site.